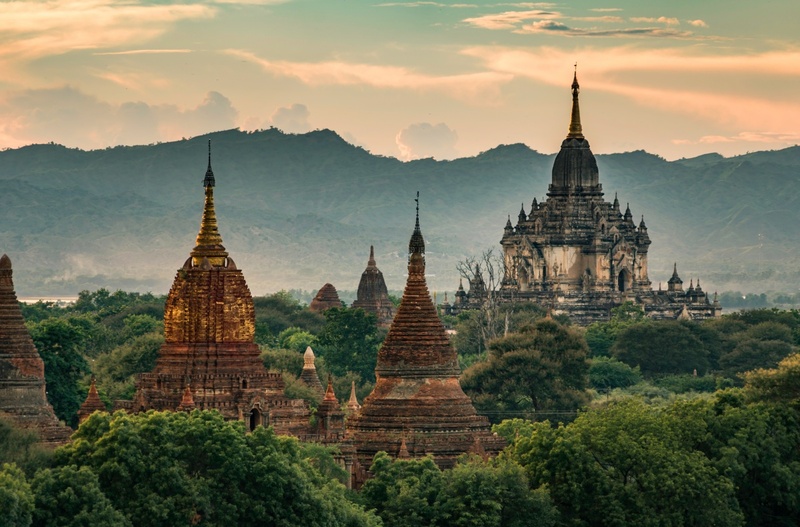 Three beautiful Bagan temples just before sunset in Myanmar. The biggest one in the back is called Thatbyinnyu temple. Sunsets and sunrises are famously beautiful in Bagan and all the climbable main temples are usually pretty full of people. This photo was taken from Shwesandaw Pagoda, which is usually one of the most crowded ones. Be there on time. Tip: You can also see the sunset outside the temples. There is temple called Pya Tha Da which has pretty high hill nearby (about 200m to north-north-west from temple) where the views are also apparently nice and not crowded.